The Robotic Coordinate Measuring Machine (R-CMM) is becoming a familiar sight on many manufacturing floors making a significant impact on the productionization of automated shop-floor dimensional inspection. Currently, with an accuracy standard more suitable for automotive sheet metal stampings, fabrications, assemblies, castings and plastic parts metrology.news has witnessed the emergence of several new R-CMM solutions over past months with all of the major global metrology equipment suppliers now offering an R-CMM solution. The traditional six axis industrial robot, which is seeing deployment at record levels globally, is repeatable but not accurate and in order for the robot to be used by the metrology sector as a “mover” of sensors around the part under inspection its accuracy deficiencies need to be overcome. To date this has been accomplished using photogrammetry techniques. The photogrammetry system key is a freely positionable, self-contained 3D fringe projection sensor, which identifies its orientation in a higher-level coordinate system exclusively through markers fixed on the component or associated tooling (reference points). The use of markers eliminates the need for highly precise mechanics to orientate and position the sensor around the part under measurement. R-CMM pioneer GOM offers a comprehensive portfolio of its ScanBox solutions offering nine available models for different part sizes and applications including the series 7 offering complete automotive vehicle body inspection system with dual robots on 7th axis linear rails. 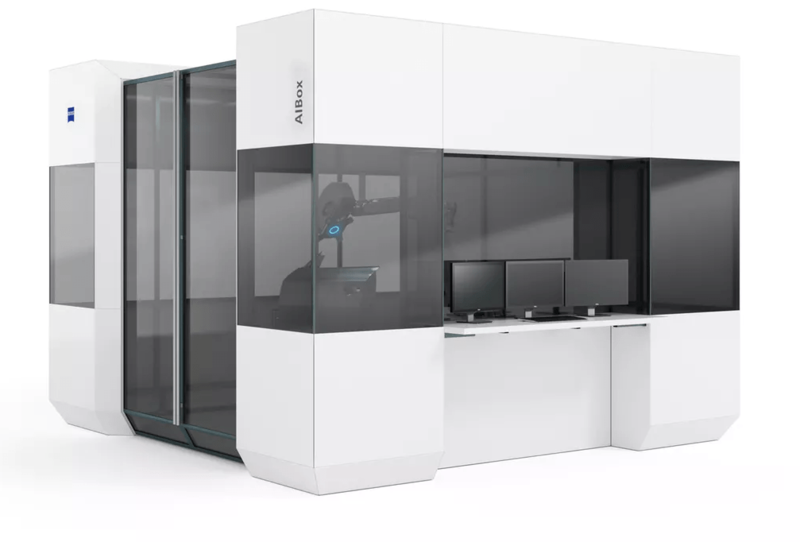 ScanBox represents a complete optical 3D measuring machine developed by GOM for the efficient quality control of the production and manufacturing process. Whereas traditional CMMs capture data in a point-based manner, optical 3D coordinate measuring systems provide full-field deviations of the 3D actual coordinates with direct comparison to part nominal CAD data. Hexagon’s Manufacturing Intelligence recently announced the launch of the 360º Cell, a turnkey solution for fully-automated 3D measurement on the shop floor. Designed to optimize the efficiency of Hexagon’s optical measurement technology range, the 360º Cell combines automation components to maximize utilization with safety features to ensure safe operations in busy manufacturing environments. A modular solution compatible with various robotic systems, the 360º Cell requires only standard electrical connections, making it easy to install and quick to make operational. Recently alternatives to photogrammetry have entered the market including the volumetric error compensation (VEC) of robots using the D-H principle. After all, every orthogonal CMM has VEC applied and increasingly the technique is being applied to machine tools, so why not the more complex 6 axis robot. An accurate robot negates the need for photogrammetry stickers. An enhancement to VEC is the dynamic tracking of robot position using an optical or laser tracker; this is akin to using measuring scales on an cartesian device where the DC servo motors drive the machine to its commanded position and the measuring scales record the actual machine position which is subsequently dynamically corrected using VEC. Creaform has launched the CUBE-R optical 3D measuring machine which capitalizes on the MetraSCAN 3D-R metrology scanner and combines efficiency and reliability of robotization in an automated industrial measuring cell ranging from 1 m to 3 m with metrology-grade volumetric accuracy in real-life shop-floor conditions. Unlike conventional CMM systems, the CUBE-R delivers both speed and volumetric accuracy. In addition, it ensures a significant increase in productivity. The CUBE-R offers a realistic and comprehensive alternative to coordinate measuring machines. The CUBE-R Industrial Robot is optically tracked removing robot positioning inaccuracies from the generated measuring data. Laser tracker pioneer API, recognizing manufacturing industry’s increasing demand for part measurement automation, with a higher degree of accuracy, has developed its Smart Factory Inspection System (SFIS) with true 6DoF real-time 3D robotic measurement incorporating its proven metrology technology and calibration components. SFIS can be delivered as a customized integrated solution or as a standard production inspection cell. 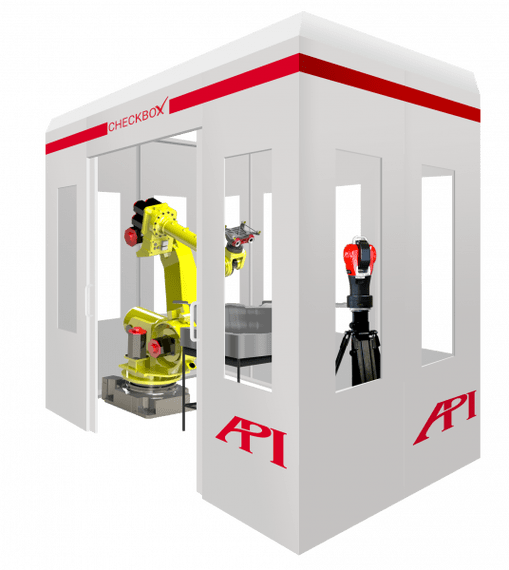 The API CheckBox is an optical 3D measuring solution developed for the inspection of production parts for installation integral to manufacturing operations. 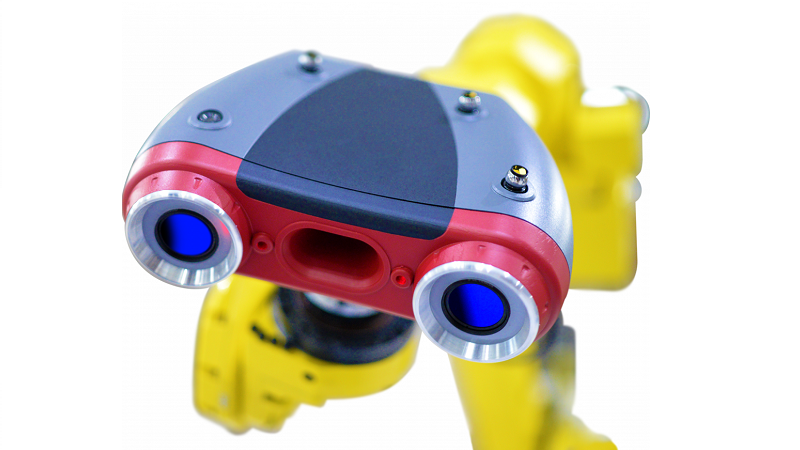 Modular in design, and scalable in size, CheckBox utilizes a standard 6 axis industrial robot with real-time encoded robot position using the API 6DoF RADIAN Pro laser tracker. Real time enhanced robot accuracy completely eliminates any requirement for stickers used by photogrammetric robotic measuring systems and is claimed to provide comparable horizontal-arm CMM accuracy. API’s RapidScan sensor offers ultra-high dynamic range with 3.2 mega-pixel stereo imaging capturing a 3D point cloud of the part within its large field of view, and is capable of measuring highly reflective and composite surfaces. With sub pixel edge detection, the (random + grid pattern) optical projection generates a highly accurate dense point cloud. The systems metrology evaluation software provides point cloud geometry extraction and surface topology creation providing direct comparison with part digital model. The Zeiss AIBox features a fully enclosed compartment which protects the high-resolution measuring technology against external influences. Extraneous light is eliminated by the enclosure, contamination reduced and temperature stability increased. The robot-guided optical 3D measuring system is primarily designed for fast at-line part analyses and powered by the measuring expertise of ZEISS. Innovative technical features such as the blue LED technology, integrated edge illumination module with the fully integrated photogrammetry system laying the foundation for providing excellent overall accuracy of the 3D measuring system. Universal metrology software supplier Metrologic has developed its Metrolog X4 i-Robot software product suitable for use with all industrial robots brand and models; it provides a production-ready R-CMM software solution. Flexible with any measurement system, the Metrolog X4 i-Robot measuring system is based on a high speed acquisition scanner attached to the robot wrist. The robot, of any type or brand, without specific accuracy, behaves as a simple tool holder. The measuring accuracy is provided, either by a separate tracking camera following the laser sensor box equipped with positioning LEDs, or by a laser tracker system. One huge advantage of the R-CMM is that since optical sensors have a large field of view the amount of robot positions (poses) necessary to capture a full part geometry are few which significantly reduces system programming times when compared to programming a traditional CMM to inspect the same part features. In addition a CMM only measures what is instructed through part program execution while the R-CMM captures a complete point cloud of the part under inspection enabling full geometrical feature extraction with direct comparison to CAD together with a full surface topology analysis, an ever critical requirement of manufactured parts. Captured point clouds can be stored for subsequent analysis providing root-cause analysis tools for engineering. The R-CMM is here to stay and with the latest developments in robot calibration techniques is likely to be an a ever more frequent visitor to a manufacturing floor near you.